Will my kids have HH? I’m often asked if I’m worried about passing Hyperhidrosis on to my kids. HH runs in my family, so I know that there is a pretty good chance of passing it on. I’ve given this a lot of thought for many years. In the past, I was concerned about passing it on because I know the difficulties of HH first hand and I don’t want my children to suffer through it. Children especially have trouble with HH in school and social activities. Years ago, a part of me thought my future children would be angry with me for passing it on. However, after more thought and discussion with family members, I can say that although there is a high chance of passing HH on to my kids, it doesn’t deter me from wanting to have my own children. I have always wanted to be a mom. In fact, if my children are born with HH, I will be incredibly well-equipped and be their biggest support. I will be able to share coping techniques and be knowledgeable about treatments. I will be a huge resource and am confident I will be able to help them. A couple of months ago, I suggested some over the counter treatment options for my younger cousin who also has HH. He is in middle school now and has had HH for his whole life. Out of the options I suggested, he chose to start with a lotion called Dry Grip No Sweat. He is having great success with the product so I thought it would be a fun idea to interview him about it and his experiences with HH. A big thank you goes out to him for helping me with this post! Caryn: What do you think the hardest part of having HH is? Cousin: I think the hardest part of HH is having to deal with it all the time. I mean, unless it was the winter, usually my hands were sweaty. I personally had a really tough time getting used to it, and even now. I just want it to be done with. Caryn: What difficulties do/did you find in school with HH? Cousin: It is quite hard to cope with it at school, like when you accidentally touch someone, or when you have to pass something around and you get it really sweaty, or trying to hold a pencil but your hand keeps slipping off, it becomes annoying, and sometimes embarrassing. Caryn: Do/did you have any difficulties with HH outside of school? Cousin: I absolutely had troubles with it outside of school. Trying to do sporting activities was a bust, I couldn’t really touch anyone, and eventually I started to get stressed. Stressed that it wouldn’t go a way, no matter what I tried to do about it. 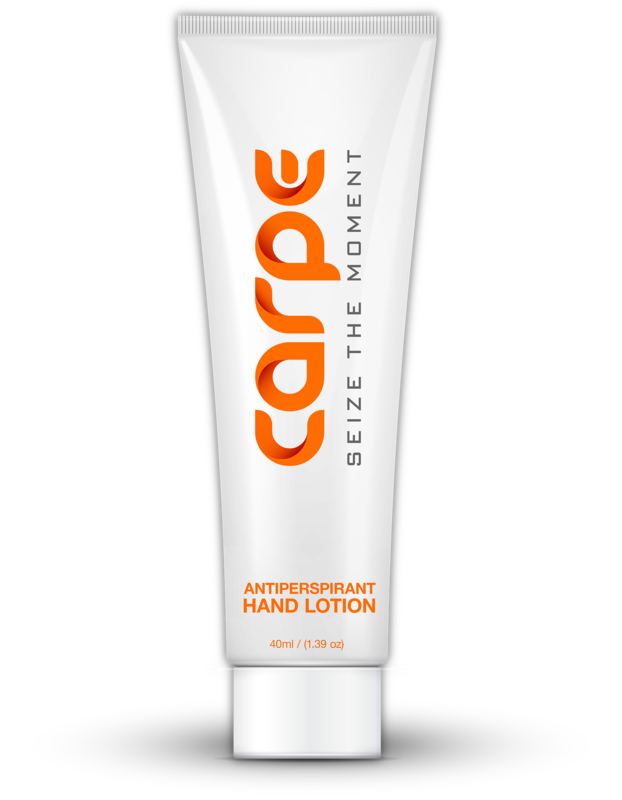 Caryn: How often do you apply the lotion and how does it make your hands feel? Cousin: I apply the lotion every morning on weekdays, and at first it feels like glue because it’s sticky, but that only last for about 5 seconds. Other than that, I don’t feel it whatsoever, and often forget I put it on that morning. Caryn: How successful do you think it has been? Cousin: I believe it has worked quite well, but I like to think of it as brushing your teeth. It’ll only work if you consistently do it, as for most things. Now even though I’m not applying it on weekends, I just do that so my hands don’t get used to it, so I can use the same lotion for longer. Caryn: How has your day to day life changed since using the lotion? Cousin: My day to day life has changed for the better, no doubt about it. I hardly notice my hands sweating, and usually that’s after gym in school. I no longer have the problems I used to have in school, and I much enjoy it. It really stinks to have HH, but if you don’t do anything about it, it won’t go away. I always knew that Hyperhidrosis ran in my mom’s side of the family. Her sister (my aunt) was born with it and so were her two boys (my cousins). I was surprised to hear earlier this year that a cousin on my dad’s side of the family was recently diagnosed with the condition. My dad told me about my cousin’s diagnosis and I reached out to her. She told me she went to a doctor and was prescribed a product called Hypercare. I had never heard of this treatment before but looked it up to find that its active ingredient is Aluminum Chloride. She is having success with this product! I am thankful that I can talk to my family members about Hyperhidrosis openly and recently helped out my younger cousin on my mom’s side who hadn’t tried any previous treatments. After sending him and his mom a compiled list of some mild treatment options, he decided to go with an over the counter hand lotion. He is having a lot of success with this product so far! It’s called Dry Grip and can be found on Amazon. HH runs in my family, but so does support. We are all very willing to listen and talk about HH and help each other out. I sincerely apologize for not posting for over 2 months. Life quickly got very hectic as the semester started- both in work and in my personal life. If I didn’t have time to post, you can only imagine the trouble I had finding time to keep up with Iontophoresis. I missed way more treatments than I am happy to admit, and so of course, my sweating has returned. The sweating is not as bad as what it was before Iontophoresis, but it is still present. No matter what, HH is in my genes. It’s in my DNA. Without treatment, I will always sweat. I feel so angry with myself. I finally found a tool that helps my HH, and I am not taking advantage of it. Yes, I’ve been really busy, but I know I could have found more time than I felt I had. I’m blaming only myself. When I think about my situation, my mood starts spiraling downwards. Mostly I am just angry with myself. Holidays are coming up, and I will be able to take more time off from work. I’m definitely bringing the Iontophoresis device home and will be using it every other day. I’m going to start the initial treatments again. Hope all is well with you and Happy Holidays!